“Encouraged to sign up for Toadstool Corners’ Great, Green Garden Tour, rabbit Timo begins feverishly planning and improving his garden. With rhythmic pairings of activity (‘He trimmed and he tidied. He hurried and he scurried. Her raked and he staked. He worked and he worried’), Timo toils with boundless determination and relentless perfectionism, leaving little time to spend with his friends. Though tempted by Hedgewick’s spinach cakes, a visit to the lake, and tennis with Suki, it is only when a rainy day interrupts his efforts that Timo realizes he should have been tending to his friendships instead of his plants. “Toadstool Corners is hosting the Toadstool Corners’ Great, Green Garden Tour in a week. Several of the animals in the community have signed up for it already. Rae the badger thinks that Timo’s garden should be on the tour too. Though Timo does not think his garden is ‘Great,’ he does have a week to make it better than it is now, and so Timo adds his name and address to the list of participating gardens. That afternoon Timo assesses his garden. It is very nice with its flower borders, herb garden, sitting bench and lawn, but he feels that it needs more, so he starts writing out some lists. He writes a ‘Things I want to keep’ list, and a ‘Things I do not want to keep’ one. Finally he writes a ‘Things I want to add’ list. He would like to add more flowers, new mulch, and perhaps a grape vine. The next day, on Monday, Timo gets to work weeding, watering, hoeing, and hauling. 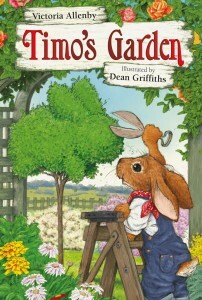 The garden starts to look nicer, but it is still ‘not quite great.’ Then Hedgewick pays a call. He asks Timo for some parsley, which the rabbit is happy to give his friend, and then he invites Timo to come over for lunch. Hedgewick is making spinach cakes, which are always really delicious. Timo is tempted, but he declines the invitation. He has far too much to do to get ready for the garden tour. With every day that follows, Timo gets more and more concerned that his garden isn’t going to be good enough for the tour and he works harder and harder to get it ‘ready.’ He also declines one invitation after another, choosing to spend all his time working, and none of his time with his friends. He starts to feel tired and decidedly unenthusiastic about gardening. What used to be a joy is now a trial. Then something unthinkable happens and all of Timo’s plans and hopes are ruined.